Pictured, left to right, with staff from Human Concerns are Trinity students Peyton Bond, Leah Kelly, Madalynn Tunis and Andrew Shaver, as they deliver some of the produce grown in their garden. West Side Community Garden, where Kelly secured a plot of land for Trinity to start a small crop of its own. Volunteers spent the growing season planting, weeding and watering. 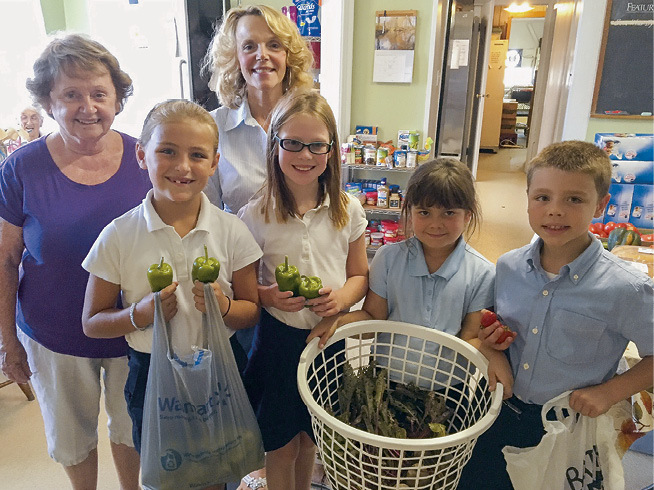 As the harvest was collected, students donated the fruits and vegetables to Human Concerns, a food pantry that serves the surrounding community. The project will continue this spring, as students learn not only a valuable lesson in science but an appreciation for God’s bounty and the joy of giving to others.